In 1947, Indian subcontinent was divided into two countries Pakistan and India, which Pakistani nationalists propagated as a great success of Muslims to secure their rights. The question which will be addressed in this article, was it a real success and met the ambition of All India Muslim league for which it was established? All Indian Muslim League primarily established in 1906 to secure Muslims economic interests of the Muslims living in a Hindu dominated regions, therefore, none of the politicians from the Muslims dominated area took much interest in its politics. 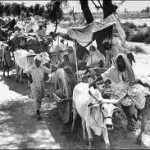 Muslims in the regions of Punjab, Sind, Bengal, Baluchistan and NWFP (now Khyber PuktoonKhawa) were not among the Muslims group who felt real disadvantageous or deprived in comparison with Hindus due to the simple fact that they were in the majority. They were having their own government and Muslims were more or less in harmonious relationship with other ethnic and religious groups. For example, Unionist Party was strong in Punjab and forming the government with minorities without much religious tug-of-war. The situation was not very different in other Muslims dominated provinces. When Jinnah took the leadership of All Indian Muslim League, he wished to gain the stature of Congress and Gandhi. Jinnah had always been more interested in central politics than regional and the Muslim regional leaders were only interested in regional politics than central; so, there was a vacuum as to who should have represented them in the center. Jinnah recognized this vacuum and declared himself as the sole figure to represent Muslims interests. The title of the Sole representative could not be possible for Jinnah until the major leadership of provinces like Punjab and Bengal support the idea, so he requested the regional leadership to accept him as a Muslim representative in the Center; and, in return he pledged that he would not interfere in the provincial politics. The Unionist Party leadership considered it as an innocent request and approved it because they could not dream of disintegration of India and losing power. Initially, All Indian Muslim League penetrated in the Muslim dominated regions by making alliances with the established and strong political parties and groups; later they strengthened the party through the disgruntled politicians of the established political parties and groups with whom they had made alliances. They used religion to gain the sympathies of Muslims, which spoiled the harmonious relationship between Muslims and members of other religions. It was good luck of All India Muslim League and Jinnah that the World War II started where the British were looking for Indian support. Gandhi and Congress were not interested in to provide unconditional support but Jinnah was eagerly provided this support to be accepted as the sole leader of Muslims. The British also helped him in achieving his goal and ignored other regional leadership in negotiations. At the end of the war, the British had to leave India but they had to reward to Muslims too for their support, so the easy solution was to divide the country along the lines of the 1935 Act in which provincial autonomy was already given and rights of people were secured. The solution was internally seen well by the Congress because they realized keeping these Muslim’ areas would create trouble for the Indians. Indeed, this was the best face saving solution for Jinnah and the Muslim League, as well. In this shallow divide, we lost all princely states where Muslims were in the majority. Muslims were divided in two parts Pakistan and India. The Muslims lost the historical name of India and lost the battle of original demands. The original demand of All India Muslim League was to secure economic prosperity for Muslims living in a Hindu dominated areas was totally ignored at the time of Independence. The majority of Muslims left in India as untrusted nation and the Muslims living in Muslim-dominated area remained salves of the same leadership. The opportunists left the old parties and joined the All India Muslim League by 1946 when it was slightly clearer that the Muslim dominated area might be separated. Islam was rigorously misused by the so-called nationalists to divert the expectations of economic prosperity of common people. So called the secular forces created a room for religious forces so that people remain in confusion as to why they got a new country – and, they are till today. Jinnah hardly strived for changing the back door ugly politics of ‘give and take’ because he got popularity by employing the same tool. The mission and vision of the then politicians were to hold the power and not to promote the real interests of the common people. Pakistan is a product of events instead of legitimate vision and mission. The time has proved that it was a shallow division of India, therefore, the people of Pakistan have yet to find a direction even after 65 years of independence. Now those forces who think to ‘break the Berlin Wall’ are not only wrong but working behind the walls to negotiate to protect their own vested interests. Now masses must understand, if they support such a decision at any stage they would not be part of the beneficiaries. The best for masses is to reject their so-called current religious, political, bureaucratic and military leadership and their descendants (any family member) in order to build Pakistan. Note: Nationalists are welcome to make a debate.